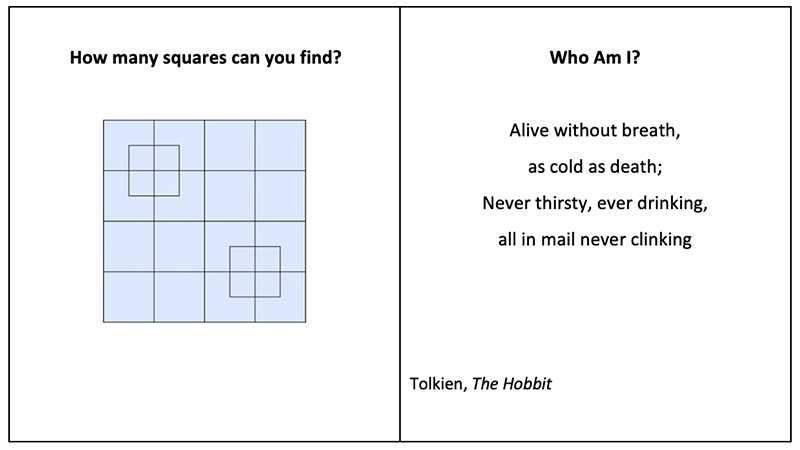 Each of the two riddles above differ dramatically in terms of the thinking processes required to solve them. The problem on the top left calls for a systematic, meticulous thinking process. The riddle on the top right requires holistic, associative thinking. Success in problem solving often depends on the congruency between the type of problem people are trying to solve and the cognitive processes they bring to bear in doing so. My work examines how people approach challenging tasks that require high-order thinking, such as riddles. The thinking process people employ when facing a specific task is influenced by the mindset they assume at the moment of judgment. I am particularly interested in understanding the role cultural mindset plays in directing thinking processes and influencing performance. Culture can be defined as a system of meaning, a lens through which members of particular groups view and interpret their physical and social environments. Social scientists have long recognized the prominent role of culture in shaping how people perceive and react to reality. Much research has examined the opposing cultural values of individualism and collectivism, which distinguish between cultures that promote autonomy, encouraging their members to identify and act on their own interests, skills and desires, and cultures that view their members as integral parts of the group encouraging them to strive towards the safety and prosperity of the group. In a recent project, Lilach Sagiv and I investigated whether performance in problem solving is affected by the match or mismatch between the solver’s cultural mindset and the type of problem being faced. Daphna Oyserman’s Culture-as-Situated-Cognition (CSC) Theory defines cultural mindset as a cognitive schema composed of goals, content, and procedures. The individualistic mindset emphasize goals, content and procedures relevant to autonomy and separation, whereas the collectivistic mindset emphasize interdependence and connection. Hence, individualistic mindset fosters analytic, object-oriented thinking processes, whereas a collectivistic mindset fosters a holistic, context-oriented thinking. In our research we thus hypothesized that an individualistic mindset would facilitate performance in solving problems that require systematic analytic thinking (such as the counting squares riddle), whereas a collectivistic mindset would facilitate performance in problems requiring holistic associative way of thinking, one that is better able to look beyond a focal object and take the entire context into account (such as the Who am I? riddle). We began by defining the differences between the two types of problems, rule-based and context-based, based on three fundamental criteria: 1) the focus of attention (focal objects versus the larger context); 2) the thinking process (searching for rules versus identifying common features, links, and contextual clues); and 3) the type of inference system favored (analytic versus holistic logic). We then conducted seven studies investigating the impact of the interaction between cultural mindset and problem type on performance. In the first study, we followed traditional research on cultural differences, comparing cultural groups that differ considerably in their emphasis on individualism versus collectivism. Specifically, we chose to study cultural groups relevant to the Israeli social context: Arabs and ultra-Orthodox Jews who live in Israel and Jewish Americans who visit Israel. The first two groups, while differing in many respects (including religion, the language spoken in their communities, and their political views), both come from collectivistic cultures that value communal bonds and group solidarity. In contrast, Jewish Americans can be assumed to endorse Americans’ individualist ideals. As expected, Arab and ultra-Orthodox participants performed better in context-based problems, whereas Jewish Americans performed better in rule based-problems. Our next studies employed a more contemporary approach to measuring culture and used methods that allow us to test the causal relationships between cultural mindset and success in problem solving. The CSC theory posits that the social surroundings of all cultures are complex, and include cues of both individualism and collectivism. It is the relative proportion of cues pointing toward one or the other that determines the tendency of the cultural group towards individualism or collectivism. Moreover, individuals can develop both an individualistic and a collectivistic cultural mindset, and can shift between them as required based on situational cues. Consider the case of Arabs in Israel. They live in a bilingual, bicultural reality, exposed to both the Arab and the Israeli cultures. We reasoned that language can serve as a cultural cue with Arabic prompting a collectivistic mindset and Hebrew prompting an individualistic mindset. To test whether this situational cue of language affect problem solving, we conducted an experiment in which Arab students, fluent in both Hebrew and Arabic, were randomly assigned to two language conditions. The procedure was identical across the conditions except for the language. As expected, we found that whereas Hebrew facilitated performance in rule-based problems, it attenuated performance in context-based problems. Language is a strong cultural cue, as it is deeply grounded in the listener’s social surroundings. But it is also grounded in a specific cultural context, limiting the generalizability of the findings. We wanted to show that the effect we identified holds beyond any specific cultural context. To do this, we developed a series of priming tasks focusing on fundamental manifestations of individualism versus collectivism, including a verbal prime (words emphasizing the group versus the individual), a visual prime (images directing attention to focal objects versus the context); and a physical prime (a simulation aimed at creating a sense of being independent from the group versus interdependent within the group). The results from these studies consistently indicated that an individualistic mindset improves performance in solving rule-based problems, and a collectivistic mindset improves performance in solving context-based problems. This research shows a consistent impact of individualism versus collectivism on performance on cognitive tasks involving complex higher-order thinking. More research is needed if we are to understand how to apply these findings in real-life settings, such as education or work organizations. In the meantime, when you are asked to tackle a problem you might want to keep in mind the nature of the problem (which thinking process it calls for), the cultural cues around you (are they emphasizing individualism or collectivism), and the congruency between them. Dr. Sharon Arieli is Assistant Professor in the School of Business Administration at The Hebrew University of Israel. Her main research areas are creativity, culture, and values. In her research, she integrates dispositional and situational factors that influence creative performance, studies how cultural orientations and mindsets impact identity and creativity in problem solving, and explores the impact of individual- and cultural-level values on people and organizations.